Two United States Attorneys, Bruce Fein and Bruce DelValle of Fein& DelValle PPLC have met with ten Nigerian witnesses on the suit filed in the United States District court of Columbia against 14 Nigerian defendants for their complicity in the 2016 torture and extra-judicial killings of pro Biafran agitators during their peaceful protests. The two attorneys who arrived Nigeria three days ago met with the families of the victims at an undisclosed location and also extracted various statements from them which were deposed as affidavits of facts to the suit. 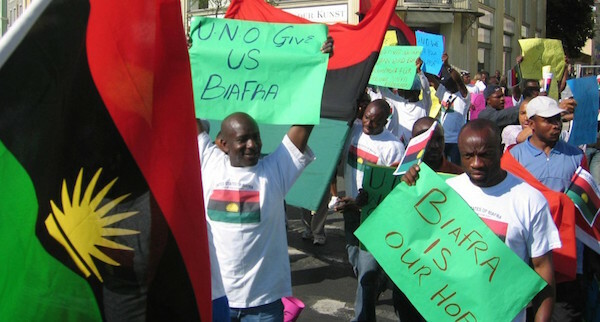 Ten Biafran plaintiffs are seeking millions of dollars as damages to compensate for their grievous losses and suffering following the alleged gruesome killings of pro Biafra agitators in Nkpor and Onitsha , Anambra State and Aba, Abia State in 2016 during the peaceful demonstration for the release of the detained leader of the Indigenous People of Biafra, IPOB, Nnamdi Kanu. The identities of the plaintiffs are hidden for security reasons while the case name is John Doe , etal vs Tukur Yusuf Buratai etal civil action No. 1:17-cv-01033. The case has been assigned to United States District Judge Ellen S. Huvelle, appointed by President William Jefferson Clinton. Speaking to Daily Sun in an exclusive chat, Attorney Bruce Fein said they were in Nigeria as a follow up to the suit already in court because of Biafra agitators who were murdered as a result of high level military and security agencies infringement of their rights to freedom of assembly and expression while the state governors could not also protect the demonstrators. He explained that under the United States law, those human rights crimes are prosecutable in the United States courts even though the plaintiffs and defendants are citizens of the country, Nigeria. Fein said after filing the case in the US court, they were able to convince the judge that revealing the identities of the complainants /plaintiffs in the suit could result in retaliations and danger against their families, hence the reason the court settled for the name John Doe etal so that it can proceed anonymously. He confirmed that 13 defendants out of 16 have been effectively served with the court summons and noted that the Igbos and Christians have the right to live in the country and enjoy their full rights as citizens of Nigeria. The Nigerian facilitators, Emeka Umeagbalasi , board chairman, International Society for Civil Liberties and Rule of Law and Okpalaezenri Emeka Onyeso of the Forum for the Promotion of National Ethos and Values, in their separate remarks noted that the struggle to ensure justice for the victims and families of those who died through the use of state power of coercion while engaging in peaceful protest is a noble cause that must be pursued to a logical conclusion. They thanked the Ekwenche Organisation of Chicago, USA for their role in the suit, noting that the capability of countries to set up laws that regulate and protect all fundamental rights of man within the context of the United Nations Declarations, Covenants, Conventions and other multilateral treaties, and punish offenders, to a very large extent, influence the level of human development in most countries of the world. Other defendants in the suit included former Inspector General of Police, Solomon Arase, former Commander 302 Artillery Regiment, Onitsha, Col Ibrahim Maigeri and Governors Willie Obiano and Okezie Ikpeazu of Anambra and Abia States among others.